Losing a tooth due to injury, dental decay, or gum disease can happen. However, in order to avoid causing problems for the adjacent teeth and your overall dental health, it is important to replace the tooth that has been lost. This can be done a number of ways including fixed bridges, removable partial or full dentures as well as a more recent procedure known as dental implants. One of the most significant dental innovations in recent times, an implant is a small surgical fixture made of biocompatible metal or ceramic materials that is placed into the jawbone and functions in the same manner as the root of a tooth. In the same way that natural root supports the natural crown of your tooth, an implant once it fully integrates with the surrounding bone, provides a stable and durable foundation for a replacement tooth. 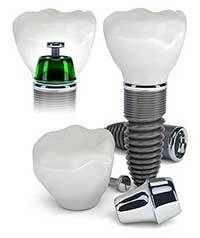 Implants often support a crown for an individual tooth, but can also be used as abutment teeth for a dental bridge, or strategically placed to help stabilize a denture. Out of all of the restorative choices available today an implant comes the closest to replicating the look, feel and function of a natural tooth. Furthermore, it is the only method of tooth replacement that does not require the involvement or preparation of the adjacent teeth. 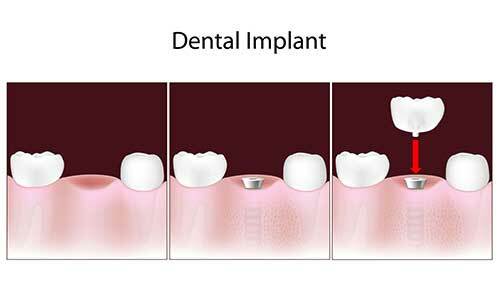 A dental implant also stimulates bone remodeling to prevent shrinkage in areas where teeth are missing and helps to restore facial contours in areas where significant bone loss has occurred.